The dark evenings of October set the tone for reflection and preparation for the winter months to come. This month’s Querent, a young man we will call Jacob, has reason to reflect as it is also the month that will mark his 28th birthday. He is looking to the Tarot this month for general guidance. The birthday is a celebration of the solar return- the passage from youth to maturity, and the development of one’s identity through the lifespan. Jacob’s birthday is of special significance to astrologers as well- for it is the time of his Saturn Return- the date when Saturn returns to its position in the Natal Chart- typically falling in the 28-30th year of life. This is a special milestone in maturity as it is associated with challenges that mark the delineation between youth and adulthood, illusion and truth, carelessness and responsibility. Saturn is also the marker of time and maturity- and Jacob’s timing couldn’t be better! For Jacob this will be a time of change, truth and challenges. A rewarding but testing journey awaits, and Jacob will be called upon this year to separate the illusions of youth from the wisdom of maturity. This is a time to clean out the closets- both internally and externally- to sort how things are from the fantasy of how we wish they would be. Tests require examining attitudes, and behavior patterns from earlier in youth which are beginning to take their natural toll. Recall that much is forgiven in youth that is not accepted in adulthood- when the puppy chews our best sneakers it is easy to smile and shrug it off, but the same act is harder to tolerate when carried out by a grown dog who can no longer draw on the “cute and innocent” factor to avoid consequences. This is this type of growth spurt Jacob will be facing in the coming year. 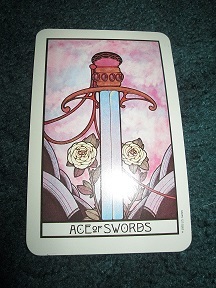 The first card is a leaper, emerging from the deck spontaneously during the shuffling process, and it is the Ace of Swords. This will be a dynamic year. A year of new beginnings no longer lingering in the abstract world of thought and fantasy- but culminating in action. Changes will be made, not just talked about. This will be a time for Jacob to jump in with both feet, to overcome procrastination and passive acceptance of what he does not find tolerable in his life. This is the time for Jacob to put his ideas into action, to challenge himself to change, assertively, that which is no longer serving his best potential. Success and accomplishment can be achieved but only by making some changes to Jacob’s routines, to get different results he must take different actions. He will be more likely to summon the courage to follow his heart this year, rather than holding back or giving in to insecurities or doubts. This is a powerful time to effect change- so take hold and accept opportunities as they arise. Like the sword itself, Jacob may find it necessary to make certain “cuts” in his lifestyle this year- cutting out sources of negativity, people or activities that stand in the way of his goals or drain his energy, unhelpful doubts or insecurities, and most importantly, cutting out excess baggage by honestly confronting lessons from the past. Willingness to accept that new beginnings are on the horizon will be crucial to breaking negative cycles and patterns that have become routine. 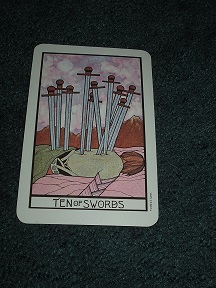 As if to echo this message, the first official card in the spread is the 10 of Swords. This is the final of the Swords suit before coming to the Court cards- thus it shows finality, closure and endings. Jacob will find that unhelpful and self-sabotaging behaviors will reach their natural conclusion- events will transpire in such a way that Jacob will have to confront bad habits and unfulfilling patterns in relationships and work, and lifestyle at large. At best, Jacob will find relief and an opportunity to take advantage of new opportunities and more mature priorities. Lifestyle changes that promote release of toxic, negative, and self-defeating routines all in preparation for new growth will begin to surface. Exits sought will be found. At worst, even resistance to change will prove futile as circumstances will unfold that make it more difficult to maintain the status quo. The culmination of stress and burdens carried in the past will weigh on Jacob until he is prepared to accept that things must change. Accepting responsibility and going with new opportunities, taking initiative and acting for his own good rather than against it, will prove an easier way to harness the energy of change. Fighting this current will only prove draining. Like a swimmer caught in a riptide, the best thing for Jacob to do at this time is face the music and roll with, not against, the current. In particular, aspects of life that included impulsivity, over-extending himself, excessive work or exercise, or risky behavior, will begin to catch up to Jacob in new ways if these issues are not addressed. Fatigue, burn out, resentment toward others, or even physical health issues or accident prone-ness are possible if things continue as they are. Jacob is entering a phase in his life where habits and choices once perceived as harmless will begin to have an impact. Be it smoking or poor eating habits, overworking or partying too hard, this is a crucial time for Jacob to act on resolutions to break destructive cycles before they catch up to him in ways that they had not previously. To give greater emphasis to the above message, the Powers that Be have slapped on a big, glaring neon sign- lest we not quite get the picture. They do this through the Tower card. 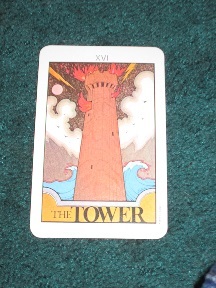 The Tower is considered the archetype of cataclysmic change. Some see only doom and gloom when reflecting on this energy, but that is like looking at school as an annoyance between summer vacations. Jacob can awaken to the energy of this card and ready himself to accept the intervention of powers greater than his conscious planning on his behalf providing just the wake-up call he needs in order to find closure where it is needed and strive for better. Imagine that a comfortable, well-rehearsed routine has become both a source of security as well as monotony and self-limitation. Sound familiar? We all have these experiences, sometimes several times at once or throughout the lifespan. Luckily we also live in a universe where things don’t always go as planned, and we don’t always get our way. When circumstances beyond our conscious control result in large scale disruptions to our cozy plans, it is easy to become upset, angry, disappointed, defeated, or feel abandoned by the Spiritual Force we once thanked when things were going our way. This is the lesson of the Tower card. So, Jacob will have the good fortune of not getting his way, of being disappointed, of realizing aspects of his plans are not sustainable. The fortune of seeing his circumstances as they are- warts and all- so that he may embrace the opportunity to rebuild. Yes, the Universe is about to kick over your sand castle, Jake, but it is because you need to understand that…well…castles made of sand melt in the sea, eventually, as Jimi Hendrix once said. What can Jacob do in light of this? Just be open minded, be cautious, be willing to accept the tides of change, and begin to see that although beautiful or special, a sand castle is not the deluxe dream house it may have passed for at one time. Begin to recognize that the beach is vast, and when one sandcastle collapses it can be a great opportunity to jump back in the water, ride the waves, move on down the shore, visit the boardwalk, make another sandcastle, or fly a kite instead. This is not the time to put all your hopes and dreams into a castle of sand, or in any one thing or object for that matter- begin to explore impermanence, make peace with powerlessness, and don’t count on things or people to provide your foundation, or to define who you are. It is also not productive to curse the wind, waves or seagulls because the sandcastle doesn’t last forever. Instead recognize the bounty that does exist in whatever landscape you find yourself and create something new. 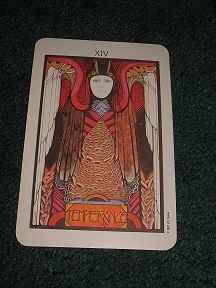 The final card in the reading is another Major Arcana card, Temperance. Like the movement, this card suggests self-discipline, patience, balance and avoidance of excess. Jacob would do well to examine where he has fallen into extremism or risky routines or behaviors. If favorite indulgences are giving way to consequences- take note, this is not the time for extremes in work, play, or partying. This is the time to moderate, modify, collaborate with others- that’s right- be open to receiving as well as giving, and have patience. This is an extremely creative time for Jacob but it will not be a time of instant gratification and instant results. The security of the ego is about to be challenged, but in this process the potential for creativity, development of crucial networks and supports, and the expression of long held internal talents are emerging. This is a process not to be rushed, so Jacob will have to curb some of his expectations. Have a happy birthday and Saturn’s return bring a new lens to see the potential that awaits. Remember, no matter where you are reading this all readings are intended for entertainment purposes in accordance with NYS law.